Throwing a baby shower for a friend who was having twin boys was very likely a once-in-a-lifetime event for me, so I wanted to do something really memorable. The added challenge was that she already had two children so she had most of her baby needs covered. Somewhere nestled in the recesses of my mind was the idea of a statue or display made of diapers. 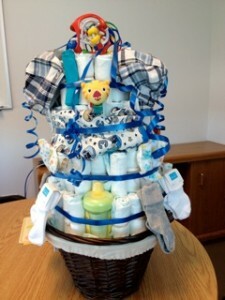 A quick search on the internet revealed a number of interesting sites with instructions and pictures of “diaper cakes” readers had made. After studying the process and looking at scores of images I jumped in and created a Diaper Cake. Bath & Body GC for Mom! I wrapped a new pizza pan in a receiving blanket. In the centre, I placed a large (round) bottle of organic baby shampoo*. Using elastic bands, I wrapped the stray ends of the receiving blanket snugly around the bottle. Then I placed about six or eight rolled diapers (secured with an elastic band) around the bottle and put a large rubber band around the entire ring of diapers, securing the bottle tightly to the pan. Next, I formed a second ring by placing diapers around the first ring of diapers. I completed it by placing a large rubber band around the second ring. Then I repeated for the third ring. I incorporated three more receiving blankets into the outside ring of the bottom layer by rolling them into similar sized rolls as the diapers. I also included some bibs into this layer; then I wrapped a huge ribbon around the whole bottom to hide the elastics and secure the rings. I continued building layers, repeating the basic ring-making instructions. I incorporated sleepers, onesies and more bibs into the outside rings of each layer. For the third and fourth layers, I added a bottle of organic baby lotion on top of the shampoo bottle and built rings around it as I did for the first two layers. Tips: Put the rubber band for each ring of diapers around the center first and then slide in the diapers. It is very difficult to set diapers up and then hold them in place while you put a rubber band around them. When you’re rolling the diapers, make sure they’re not banded too tightly as they won’t stack as well and they could be damaged. Once the structure was complete, then came the fun part: decorating my cake! 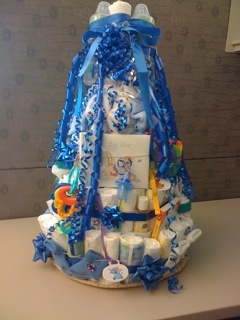 I added little baby items like pacifiers, teething rings, baby hygiene products, toys, books, bum balm, etc. I placed them between the folds of the diapers, slid them under the elastics, and tucked the larger items into the outer layer of ribbon. I made “bows” out of baby washcloths and trimmed the base with six pairs of little socks. I topped it off with two BPA-free bottles supported by four baby spoons and tons of ribbon curls. I even added candy for the twins’ older siblings and a gift card for Mom to pamper herself. This was a really fun and easy project that even children could do with a little guidance. It took me about five hours. It turned out that it wasn’t a once in a lifetime venture. 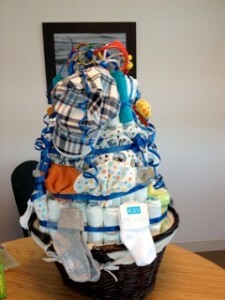 Eight months later I made another diaper cake for another colleague having twins! (We were all afraid to drink the water!) That time I spent less than two hours constructing the cake. I started it with a big basket instead of a pizza pan. Showing up at a baby shower with a diaper cake will dazzle the new mom and make her feel special. Plus it’s fun dismantling a diaper cake and discovering its hidden treasures. 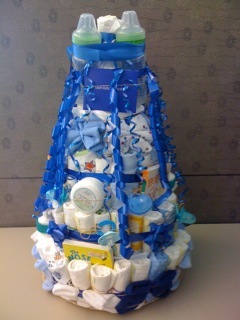 See more pictures and instructions online by searching “diaper cakes”.